RUMOR HAS IT THAT THE EARL OF DEBEN, THE MOST NOTORIOUS RAKE IN LONDON AND IN NEED OF AN HEIR, HAS SET ASIDE HIS PENCHANT FOR MARRIED MISTRESSES AND TURNED HIS SKILLED HAND TO SEDUCING INNOCENTS! 1. One touch of his lips and he'll ruin her for every other man. 2. One glide of his skillful fingers to the neckline of her dress will leave her molten in his arms. There are times when I get a craving for historical romances set in England. There is just something about all the pagentry, the intricate rules for behavior and the men of this time period. But for me to really enjoy the book the heroine has to be something pretty special. Someone who is unique for this time period. Henrietta Gibson is just such a heroine. Raised by her absentminded scholar father she is rather old for her first season at twenty-two but that doesn't really bother she will never be a slave to society. What's important to her is truth, honor and loyalty to her family. These qualities are rare enough in Society that she has trapped herself a Duke all without knowing it. Ms. Burrows is an author that I hadn't ran across so I wasn't quite sure what to expect from her writing. The characters are interesting, the dialogue snappy and the pacing is very smooth. 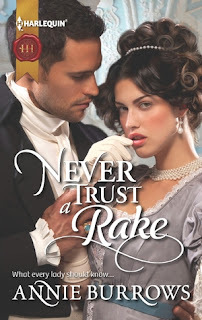 I am very happy to say that I very much enjoyed NEVER TRUST A RAKE and will be keeping an eye out for any of her future releases. I recommend NEVER TRUST A RAKE to readers of historical romance and I rate this book a 3.8.